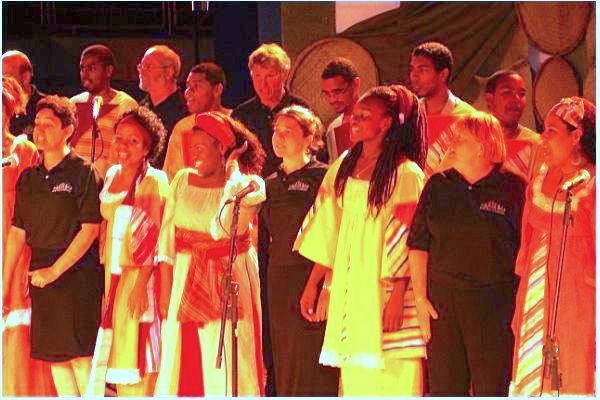 This Gospel Academy Award-winning 55-voice interfaith, multiracial choir represents the best Oakland has to offer in gospel music – Traditional contemporary and Spirituals. If I’m not mistaken, Suzanne Buell who sang with JVOI sang with OIGC for a while. Founded in 1986, the Oakland Interfaith Gospel Choir, a nonprofit 501(c)(3) arts organization, was born out of a gospel music workshop led by the exuberant Terrance Kelly at Living Jazz’s Jazz Camp West. It became an independent nonprofit organization in 1991. Since then, the award-winning Choir’s exquisite harmonies and stirring gospel repertoire have led to performances with a wide variety of esteemed groups, such as Joshua Nelson, the Prince of Kosher Gospel; the Five Blind Boys of Alabama; and the Duke Ellington Orchestra. The Choir also appears on Grammy-winning albums by Linda Ronstadt, MC Hammer, Tramaine Hawkins, and others. OIGC, a “treasured Bay Area institution,” was named “Best Gospel Choir” in 2006 and was the winner in the “Best Church Music” category in 2009 in the East Bay Express Reader’s Polls. Terrance Kelly was awarded the Dr. Edwin Hawkins Excellence Award in 2013. A gem from the golden days of James Cleveland’s Gospel Music Workshop of America. This was from the 1976 Convention that was held in New York City. Soloist: Geraldine Carter. The song was written by Warren D. Hickman. From the ever talented Jeffrey LaValley and his New Jerusalem Young Adult Choir. Very refreshing and different kind of contemporary gospel sound. One reason I like the cut is because it is so raw. The choir is not the greatest; they sound a bit “pitchy” (as American Idol judges might say) in places, but the song works nonetheless. A different sort of contemporary gospel sound from Greg Kelly. I like it! Edwin Hawkins died Monday, January 15th, 2018 at the age of 74. Most everyone knows “O Happy Day”, but not many people know the depths of the wonderful music Edwin Hawkins (and his brother Walter) brought to the world. Some of my favorite gospel songs, notably “Love Paid The Price” and “To My Father’s House”, are gifts from Edwin Hawkins. Here’s a small collection of Edwin Hawkin’s music. Rest in Peace. The recording and texts of Martin Luther King are closely controlled by his family, and are hard to come by. Here is one that many people down’t know…a short peace about Dr. King’s wishes for his funeral. I couldn’t find any transcription of the audio track otherwise I’d include to text here as well. Not EVERY song from a genius is an absolute winner. Case in point, “All I Have Is Yours” written by Richard Smallwood in 1982. Although clearly “contemporary gospel”, it seems Smallwood was trying his hand at trying to crossover into either the pop or disco market…or both, with this song. Not necessarily one of my favorites, but worth posting for what it is. An “oldie” from the Gospel Music Workshop of America’s 1982 Convention. It sounds a bit like an old Davis Sister’s song until the whole choir comes in, then it’s a whole different song. I love it. Anyone who traveled to Brazil with Joyful Voices of Inspiration in 2006 will never forget this song. The choir sang it in concert as a combined number with a fantastic youth choir in Salvador de Bahia; it was an amazing experience.